Photos by Dawn Fizzard (left) and Jenn Burt (right). 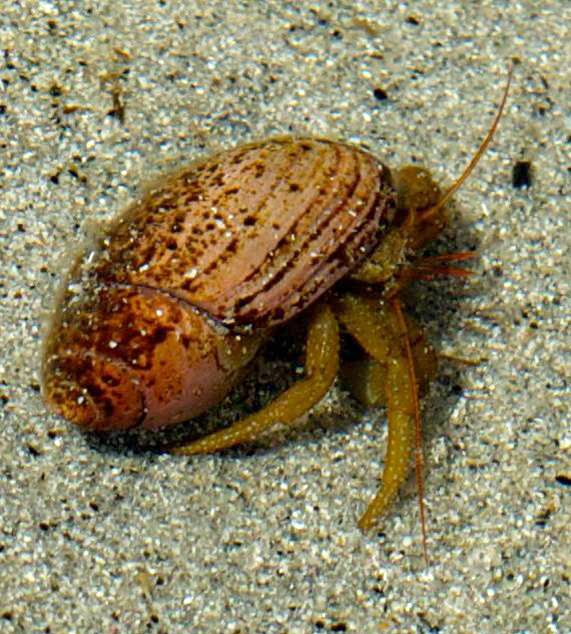 This hermit crab is readily identified by its solid orange antennae and by the white or blue granules that dot its olive-green carapace and claws. 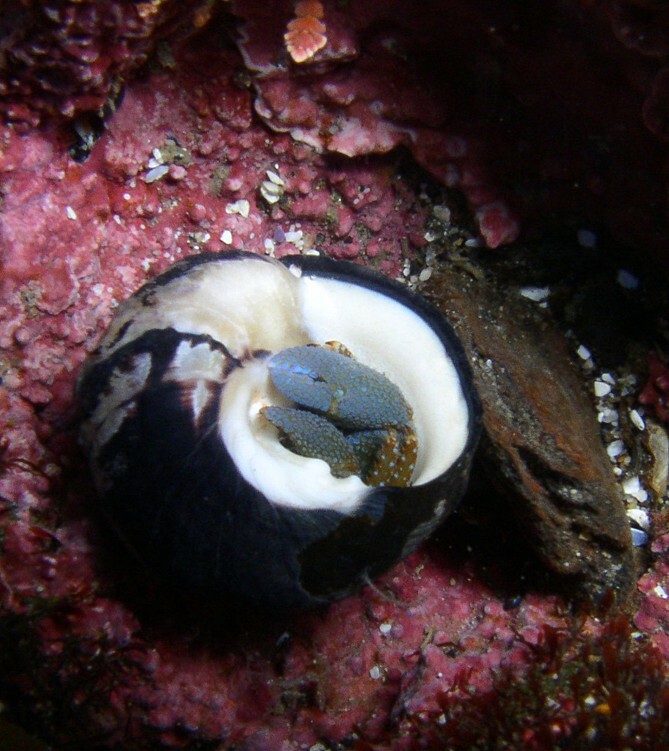 These granules are especially noticeable on the claws, and they extend to the body, unseen in the shell. The carapace gets to 2 cm long. 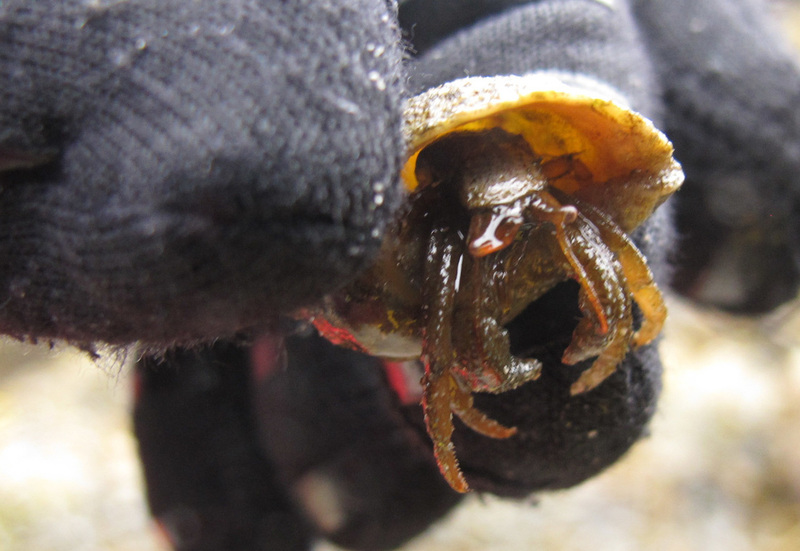 The grainyhand hermit can be found in tidepools and under rocks in the low and mid intertidal of protected beaches. It is also found in the subtidal, to 36 m deep, and may occur in groups in sandy-bottomed locations. 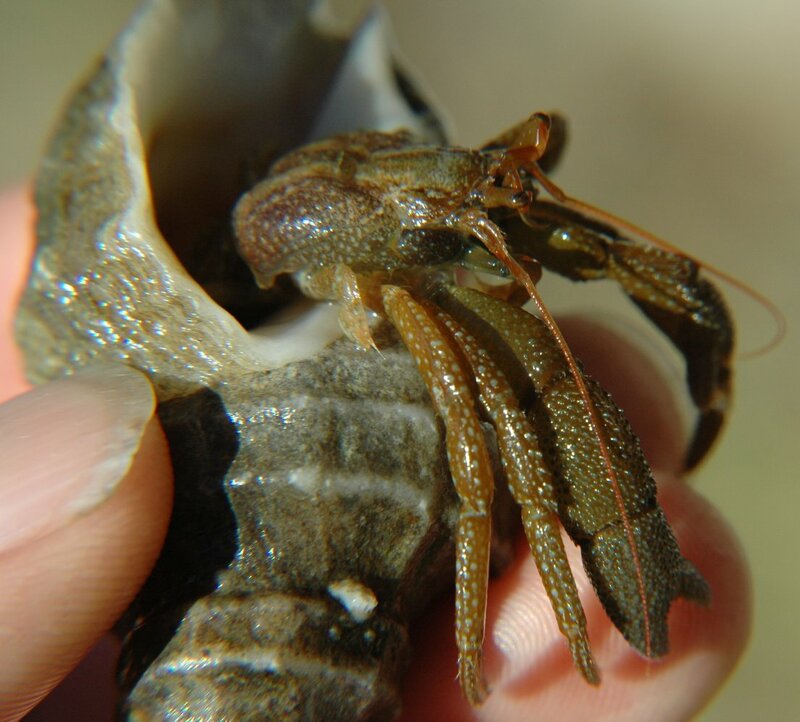 It is a fairly common intertidal crustacean, with a range extending from northern Alaska to northern Mexico. The grainyhand hermit prefers to inhabit large, bulky, cumbersome-looking shells into which it can withdraw completely. Some of the more preferred ones are black turban (Tegula funebralis), dire whelk (Lirabuccinum dirum), and frilled dogwinkle (Nucella lamellosa) shells. Cowles, D. (2005). Pagurus granosimanus (Stimpson, 1858). Invertebrates of the Salish Sea. Rosario Beach Marine Laboratory. Accessed 27/11/2015. Jensen, G.C. (1995). Pacific Coast Crabs and Shrimp. Monterey, CA: Sea Challengers. P. 27/11/2015.